Yoga is an ancient oriental discipline that emerged from mystical and philosophical concepts. Today it is practiced in the west, partly due to the promotion of its benefits to improve the lifestyle and overall health. As compared to non-Hatha Yoga (HY) practitioners, healthier and better-eating patterns have been observed in those who practice it. Agreement with the brought benefits, HY can be used as a therapeutic method to correct abnormal eating behaviors (AEB), obesity, and some metabolic diseases. However, the energy expenditure during traditional protocols of HY is not high; hence, it is not very effective for reducing or maintaining body weight or to improve cardiovascular conditioning. Even so, several observational studies suggest significant changes in eating behaviors, like a reduction in dietary fat intake and increments in that of fresh vegetables, whole grains and soy-based products, which in turn may reduce the risk for cardiovascular diseases. Given the inconsistency of the results derived from cross-sectional studies, more case-control studies are needed to demonstrate the efficacy of HY as an alternative method in the clinical treatment of disordered eating and metabolic diseases. Context: Resting heart rate variability (HRV) is a measure of the modulation of autonomic nervous system (ANS) at rest. Increased HRV achieved by the exercise is good for the cardiovascular health. However, prospective studies with comparison of the effects of yogic exercises and those of other endurance exercises like walking, running, and swimming on resting HRV are conspicuous by their absence. Aims: Study was designed to assess and compare the effects of yogic training and swimming on resting HRV in normal healthy young volunteers. Settings and Design: Study was conducted in Department of Physiology in a medical college. Study design was prospective randomized comparative trial. Subjects and Methods: One hundred sedentary volunteers were randomly ascribed to either yoga or swimming group. Baseline recordings of digital electrocardiogram were done for all the subjects in cohorts of 10. After yoga training and swimming for 12 weeks, evaluation for resting HRV was done again. Statistical Analysis Used: Percentage change for each parameter with yoga and swimming was compared using unpaired t-test for data with normal distribution and using Mann-Whitney U test for data without normal distribution. Results : Most of the HRV parameters improved statistically significantly by both modalities of exercise. However, some of the HRV parameters showed statistically better improvement with yoga as compared to swimming. Conclusion: Practicing yoga seems to be the mode of exercise with better improvement in autonomic functions as suggested by resting HRV. Context: Chronic low back pain (CLBP) is a significant public health problem that has reached epidemic proportions. Yoga therapy has emerged as one of the complementary and alternative therapies for CLBP. 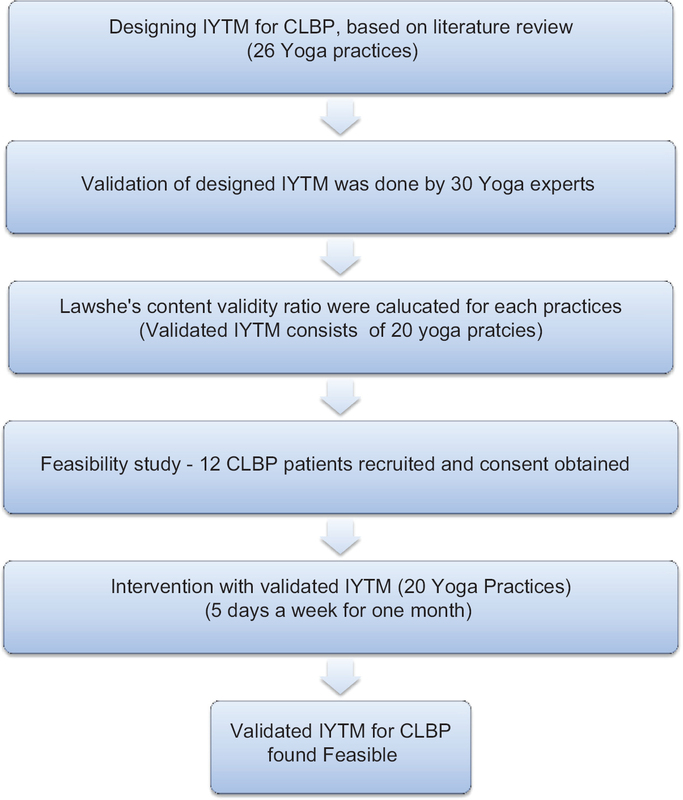 Aim: The present study reports the development, validation, and feasibility of an integrated yoga therapy module (IYTM) for CLBP. Settings and Design: This study was carried out at the SVYASA Yoga University, Bengaluru, South India. The IYTM for CLBP was designed, validated, and later tested for feasibility in patients with CLBP. Materials and Methods: In the first phase, IYTM for CLBP was designed based on the literature review of classical texts and recently published research studies. In the second phase, designed IYTM (26 yoga practices) was validated by thirty subject matter (yoga) experts. Content validity ratio (CVR) was analyzed using Lawshe's formula. In the third phase, the validated IYTM (20 yoga practices) was tested on 12 patients for pain, disability and perceived stress at baseline and after 1-month of this intervention. Results: A total of 20 yoga practices with CVR ≥0.33 were included, 6 yoga practices with CVR ≤0.33 were excluded from the designed IYTM. The feasibility study with validated IYTM showed significant reduction in numerical pain rating scale (P = 0.02), Oswestry disability scale (P = 0.02), and Perceived Stress Scale (P = 0.03). Conclusion: The designed IYTM was validated by thirty yoga experts and later evaluated on a small sample. This study has shown that the validated IYTM is feasible, had no adverse effects and was useful in alleviating pain, disability, and perceived stress in patients with CLBP. However, randomized control trials with larger sample are needed to strengthen the study. Introduction: Ayurveda is known for philosophical basis, and its approach to psychological ailments is quite different from conventional system of management. Satvavajaya Chikitsa (Ayurvedic psychotherapy) is a nonpharmacological approach aimed at control of mind and restraining it from unwholesome Artha (objects) or stressors. Withdrawal of the mind from unwholesome objects is known as Sattvavajaya Chikitsa or it is a treatment by Self Control. Charaka defines it as a mind controlling therapy in which a stress has been laid on restraining of mind from unwholesome objects. Thus, it includes all the methods of Manonigraha and Astanga Yoga (Yogic techniques) too. Indian philosophy portrays Astanga Yoga as a primary tool to control mind; hence it can be used as Satvavajaya Chikitsa. Aims and Objectives: To evaluate efficacy of Satvavajaya Chikitsa and Aushadhiya Medhya Chikitsa for improving Smriti in young healthy volunteers. Materials and Methods: Totally, 102 physically healthy volunteers between age group 16 and 25 years were divided into two groups. In Group A, Satvavajaya Chikitsa was adopted in form of Yogic procedures such as Asana, Pranayama, Chanting etc., with counseling and placebo. Group B was Shankhapushpi tablets made with whole part of Shankhpushpi plant was used as standard control. The Weschler's memory scale (WMS) was adopted to collect data before and after intervention period of 2 months. Paired and Unpaired t-test were used for analysis the data in Sigmastat Software. Results: Group A (Satvavajaya + placebo) with counseling showed statistically highly significant result (P < 0.001) in verbal retention for similar pair, verbal retention for dissimilar pair and visual immediate tests; while Group B (Shankhapushpi tablets) showed significant result (P < 0.01) in auditory delayed, visual delayed, auditory recognition and visual recognition tests. Conclusion: Satvavajaya Chikitsa shows better results in immediate recollection in terms of short-term memory; while Shankhapushpi found much better in long-term memory enhancement on various tests of WMS. Background: Mindfulness along with breathing is a well-established meditation technique. Breathing is an exquisite tool for exploring subtle awareness of mind and life itself. Aim: This study aimed at measuring changes in the different parameters of electrophotonic imaging (EPI) in anapanasati meditators. Materials and Methods : To carry out this study, 51 subjects comprising 32 males and 19 females of age 18 years and above (mean age 45.64 ± 14.43) were recruited voluntarily with informed consent attending Karnataka Dhyana Mahachakra-1 at Pyramid Valley International, Bengaluru, India. The design was a single group pre- post and data collected by EPI device before and after 5 days of intensive meditation. Results: Results show significant changes in EPI parameter integral area with filter (physiological) in both right and left side, which reflects the availability of high functional energy reserve in meditators. The researchers observed similar trends without filter (psycho-physiological) indicating high reserves of energy at psycho-physiological level also. Activation coefficient, another parameter of EPI, reduced showing more relaxed state than earlier, possibly due to parasympathetic dominance. Integral entropy decreased in the case of psycho-physiological parameters left-side without filter, which indicates less disorder after meditation, but these changes were not significant. The study showed a reversed change in integral entropy in the right side without filter; however, the values on both sides with filter increased, which indicates disorder. Conclusion: The study suggests that EPI can be used in the recording functional physiological and psychophysiological status of meditators at a subtle level. Background: Human immunodeficiency virus (HIV) infection is one of the most debilitating conditions which have affected nearly 32 million people across the globe. Antiretroviral therapy (ART) is the standard care given to the HIV positive individuals. But the patient adherence to ART is found to be very less as per previous studies. Complementary and alternative medicine is becoming a pillar in the rehabilitative efforts for many living with HIV/AIDS. Aim: To evaluate the effect of naturopathy and yoga intervention on CD4 counts of HIV patients. Methods: Ninety-six patients prediagnosed as HIV positive were enrolled after obtaining written consent and treated with naturopathy and yoga interventions like hydrotherapy, diet therapy, mud therapy, counseling, etc., for various durations at National Institute of Naturopathy Sanatorium. They were grouped into four groups (G1: 1-7 days, G2: 8-15 days, G3: 16-30 days, G4: >30 days) based on duration of stay. CD4 count of each individual was recorded pre- and post-stay. Results: All analyses were conducted using R package version 3.01. Dependent sample t-tests were conducted to examine the significance at 95% confidence interval. Of the 96 patients, male patients constitute 55.2% and female patients 44.8% with mean age 34.74 received 1-180 days (mean 28.75, standard deviation: 14.16) treatment. Significant increase in the CD4 count was observed in two out of the four groups (G2: P = 0.052, and G4: P = 0.00038, respectively). Conclusion: An increasing trend in the CD4 count was observed that was proportional to the length of the stay of participants at the HIV sanatorium. This indicates the possibility of lifestyle changes can bring positive outcomes in people living with HIV/AIDS when used as an adjuvant with ART care. The lack of control group is a major limitation of this study. No attempt was made to study the subjective changes in the quality of life, viral load, etc., However, larger controlled studies are warranted for conclusive results. Background and Aim: Recovery of patients with chronic low back pain (LBP) is depended on several physical and psychological factors. Therefore, the authors aimed to examine the efficacy of mindfulness based stress reduction (MBSR) as a mind-body intervention on quality of life and pain severity of female patients with nonspecific chronic LBP (NSCLBP). Effectiveness of mindfulness meditation on pain and quality of life of patients with chronic low back pain Eighty-eight patients diagnosed as NSCLBP by physician and randomly assigned to experimental (MBSR+ usual medical care) and the control group (usual medical care only). The subjects assessed in 3 times frames; before, after and 4 weeks after intervention by Mac Gil pain and standard brief quality of life scales. 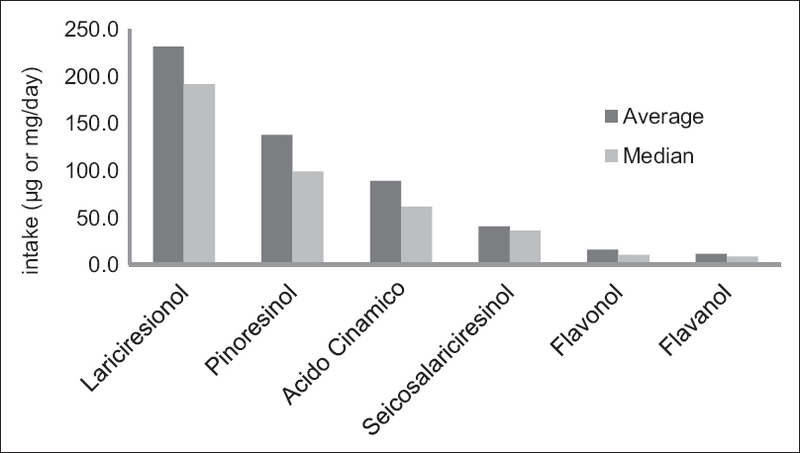 Data obtained from the final sample analyzed by ANCOVA using SPSS software. Results: The findings showed MBSR was effective in reduction of pain severity and the patients who practiced 8 sessions meditation reported significantly lower pain than patients who only received usual medical care. There was a significant effect of the between subject factor group (F [1, 45] = 16.45, P < 0.001) and (F [1, 45] = 21.51, P < 0.001) for physical quality of life and (F [1, 45] = 13.80, P < 0.001) and (F [1, 45] = 25.07, P < 0.001) mental quality of life respectively. Conclusion: MBSR as a mind-body therapy including body scan, sitting and walking meditation was effective intervention on reduction of pain severity and improvement of physical and mental quality of life of female patients with NSCLBP. Introduction: Cardiovascular disease (CVD) is the leading cause of death in developed countries. An integral part of primary prevention is physical activity. One form of physical activity to be potentially used is yoga, but this activity is associated with lower energy expenditure than that recommended for prevention. The study aimed at assessing the effect of regular yoga sessions on the aerobic capacity of the practitioners and comparing it with the normal population performing physical activity recommended by guidelines. Materials and Methods: Fifty-eight persons (16 males) with a mean age of 50.0 ± 11.06 years comprising the yoga group practiced yoga for at least 1 h a day for over 2 years. They underwent spiroergometry under maximal exercise testing to assess basic performance parameters. Their results were compared with those in 54 age-matched controls (16 males mean age of 48 ± 11.86 years performing a regular aerobic physical activity for at least 7 h a week. Results: The yoga group had statistically significantly higher maximum performance per kilogram (P = 0.007) and maximum oxygen consumption per kilogram per minute (P = 0.028). Conclusions: Despite low energy expenditure, yoga practices are better in some cardiorespiratory fitness parameters than other aerobic activities recommended by current guidelines for CVD prevention. Context: Yoga-based intervention is emerging as an effective add-on therapy in the management of schizophrenia. However, many barriers make it difficult for patients to avail yoga therapy programs. One of them is motivation for yoga therapy. Ways to address the barriers are critical to employ yoga as a treatment in this population. Aim: This study aims at exploring patients' willingness to participate in add-on yoga therapy programs on out-patient basis. Settings and Design: The study was conducted on 100 schizophrenia patients attending psychiatry out-patient services of a tertiary care hospital. Materials and Methods: A total of 100 schizophrenia patients (male: female = 57:43; age: 35.8 ΁ 9.2 years) attending the psychiatry out-patient services of a tertiary neuropsychiatry hospital were administered a survey questionnaire. Statistical Analysis Used: Chi-square test was used for testing the significance of proportions. P < 0.05 was taken to be significant. Results: About 46% were aware that yoga is also one of the complementary therapies useful in schizophrenia. 32% had tried yoga in the past for some reasons, but only 31% of them were continuing yoga; commonest reasons for not continuing being lack of motivation (31%) and inability to spare time (27.6%). However, the majority (88.5%) of them were willing to take up add-on yoga therapy on out-patient basis along with their regular medical follow-up. 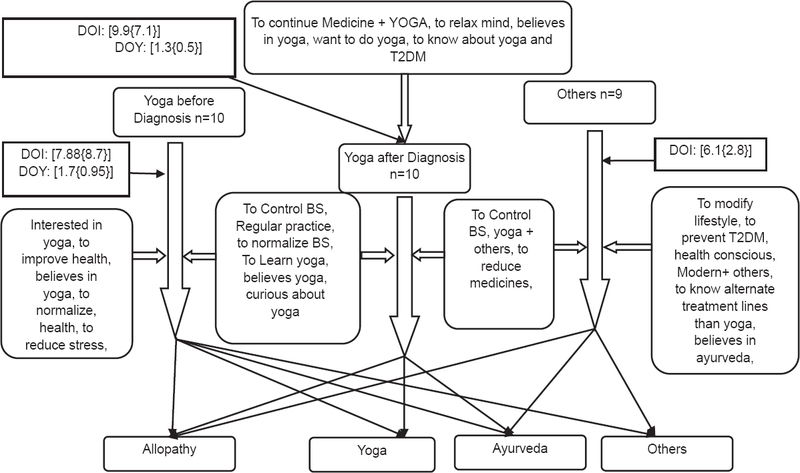 Conclusions: In spite of the lack of motivation to practice yoga, the majority of patients were willing to participate in add-on yoga therapy programs if given on out-patient basis along with their regular conventional medical follow-up. Cardiovascular disease is the leading cause of death for both men and women worldwide. Much emphasis has been placed on the primary and secondary prevention of cardiovascular disease. While depression and anxiety increase the risk of developing cardiovascular disease, cardiovascular disease also increases the risk of developing anxiety and depression. Thus, promoting optimal mental health may be important for both primary and secondary prevention of cardiovascular disease. Like lowering blood pressure, lipids, and body weight, lowering anger and hostility and improving depression and anxiety may also be an important intervention in preventive cardiology. As we strive to further improve cardiovascular outcomes, the next bridge to cross may be one of offering patients nonpharmacologic means for combating daily mental stress and promoting mental health, such as yoga and pranayama. Indeed, the best preventive cardiovascular medicine may be a blend of both Western and Eastern medicine. Introduction: The quality of life (QOL) of substance users is known to be impaired. Sudarshan Kriya Yoga (SKY), a yogic breathing program has potential to improve QOL and needs evaluation in an Indian setting. Aims: Study aimed to assess changes in QOL in treatment seeking male opioid dependent users following practice of SKY program. 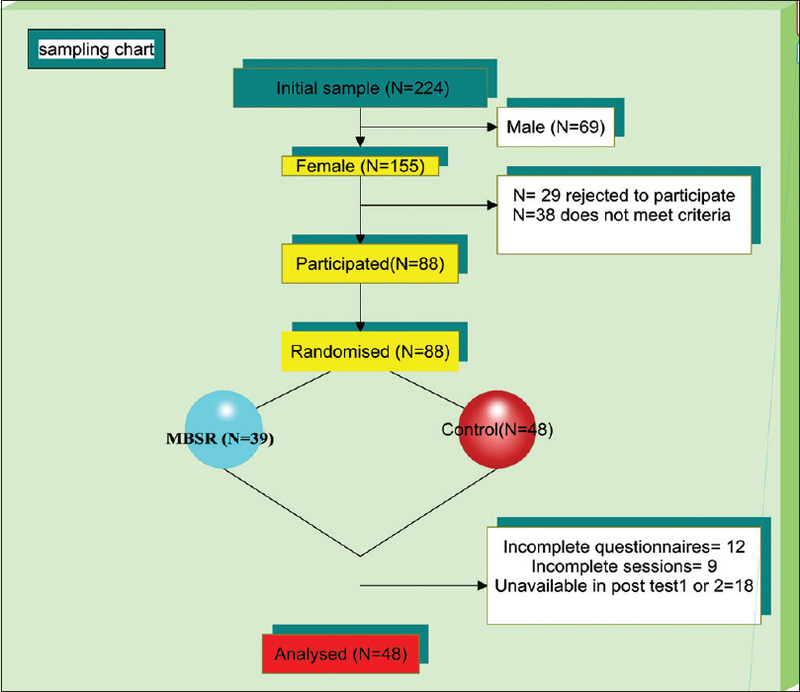 Settings and Design: Users were randomized into study (n = 55) and control group (n = 29). Study group besides standard treatment (long term pharmacotherapy with buprenorphine in flexible dosing schedule) underwent a 3 days, 12 h SKY program while control group received standard treatment alone. Materials and Methods: World Health Organization QOL-brief scale was used to measure QOL and urine tested to assess recent drug use. Assessments were made at baseline and at 3 and 6 months. Statistical Analysis: Data were analyzed using generalized estimation equation to assess within group change with time and the overall difference between groups for changes at assessment points. Results : Overtime within study group, all four QOL domain scores were significantly higher at 6 months. Between group comparison showed significant increase in physical (P < 0.05); psychological (P < 0.001) and environment domains (P < 0.001) for study group while control group showed significant changes in social relationship domain only. Urine screening results were negative for study group indicating no drug use at 6 months. Conclusion: SKY as a complementary therapy was found beneficial in improving QOL for group practicing it and is recommended for use as low cost and low-risk adjunct in substance treatment settings in India. Introduction: Diabetes is one of the major health diseases in the world today. The efficacy of Yoga in the management of type 2 diabetes is well-established. The aim of this study was to assess the prevalence of type 2 diabetes among Yoga practitioners in two districts of India (one each in West and South of India). 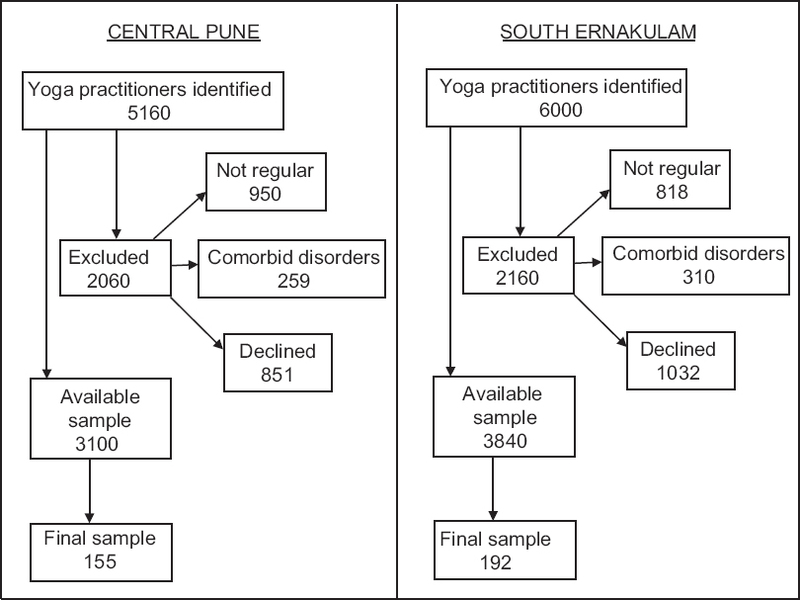 Methodology: In this cross-sectional field study, 155 Yoga practitioners from Pune and 192 from Ernakulam districts were assessed using the diabetes risk test and fasting blood sugar. The data collected were entered in a statistics software package and analyzed using the Pearson's correlation analysis, t-test, univariate ANOVA, and linear regression to understand the predictors of risk for diabetes. Results: The overall prevalence of diabetes among Yoga practitioners in Central Pune was 3.6% (95% confidence interval [CI]: [0.01-0.04]). 18.9% of participants (95% CI: [0.16-0.19]) were diagnosed to be "at risk" for diabetes. In Ernakulam, the overall prevalence of diabetes among practitioners was 26% (95% CI: [0.05-0.06]) with 12% of practitioners (95% CI: [0.05-0.06]) diagnosed to be "at risk" for diabetes (prediabetic). Higher age and lesser duration of Yoga practice were significant predictors of diabetes. Conclusion: It is essential for every person above the age of 40 to undergo regular health check-ups and screening for diabetes and involve oneself in lifestyle modification programs such as Yoga for significantly long duration of time on a daily basis, to better manage diabetes. Background: Several studies show yoga may benefit chronic pain management. We investigated the effect of a single yoga session on the perception of pain, measured by a standardized pain provocation test in healthy yoga participants while also comparing pain perception to participants' own expectations. Materials and Methods: Ninety yoga participants were recruited at hatha yoga schools in Switzerland. Pain perception was measured with a standardized algometric pain provocation test; i.e., a calibrated peg was applied for 10 seconds after which the participant rated pain intensity on a 0-10 numerical rating scale. The test was applied to the middle finger, ear lobe, and second toe before and after a 60-minute yoga session. 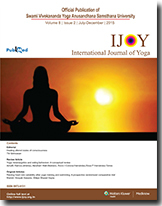 Results: Sixty out of 90 (66.7%) yoga participants expected a reduced pain perception after the yoga session. However, 36 (40%) participants actually experienced less pain after compared to before the yoga session. But overall, pain perception statistically did not significantly change from before to after the yoga session at any of the three body locations assessed. The expectations and also the previous yoga experience did not significantly influence the participants' pain perception. Conclusions: Regardless of the high positive expectations on the influence of yoga on pain, a single yoga session does not significantly influence pain perception induced by a pain provocation test. Hypoalgesic effects of yoga should be explained otherwise. Context: The traditional approach to teaching anatomy for yoga, while systematic, is often ineffective. Methods: A unique approach to teaching anatomy for a Yoga Teacher Training seminar is presented, founded on the principles of Thomas Myers' Anatomy Trains. Lab activities are detailed and Bloom's Taxonomy is applied to ensure students are engaged in higher level thinking and application. Conclusion: Going beyond the traditional approach to teaching anatomy for yoga can be extremely rewarding for students and teachers alike.